I’m sure you know this by now: The Pirates of the Caribbean: On Stranger Tides will be out in Singapore Cinemas on the 19th May 2011! Land Ahoy! Before the Pirate of the Caribbean: The Curse of the Black Pearl came out in 2003, the only pirate I knew was Captain Hook. Learning that pirates could be cool like Captain Jack Sparrow brought about a revelation. It was like learning that I could eat nutella from the jar (or anything sinful), as long I don’t get caught. Crossing paths with the enigmatic Angelica (Penélope Cruz), he’s not sure if it’s love—or if she’s a ruthless con artist who’s using him to find the fabled Fountain of Youth. When she forces him aboard the “Queen Anne’s Revenge,” the ship of the legendary pirate Blackbeard (Ian McShane), Jack finds himself on an unexpected adventure in which he doesn’t know whom to fear more: Blackbeard or Angelica, with whom he shares a mysterious past. The international cast includes franchise vets Geoffrey Rush as the vengeful Captain Hector Barbossa and Kevin R. McNally as Captain Jack’s longtime comrade Joshamee Gibbs, plus Sam Claflin as a stalwart missionary and Astrid Bergès-Frisbey as a mysterious mermaid. Jump on-board the Queen Anne’s Revenge (All Aboard SG Contest) and stand a chance to win 20 sets of movie premiums packed with a pair of complimentary tickets each and a Grand Prize – Swarovski Nightfall bracelet (Large) – worth $400! Whilst you are at the POTC 4 Facebook Fanpage, click on the Games and Activities page and play the 3 apps. Skull Creator – customise an unique skull for your facebook profile page; Pirate yourself – dress yourself up as a pirate and join Captain Jack’s crew; Battle Galleons – choose a captain to helm your ship and fire at your opponents. 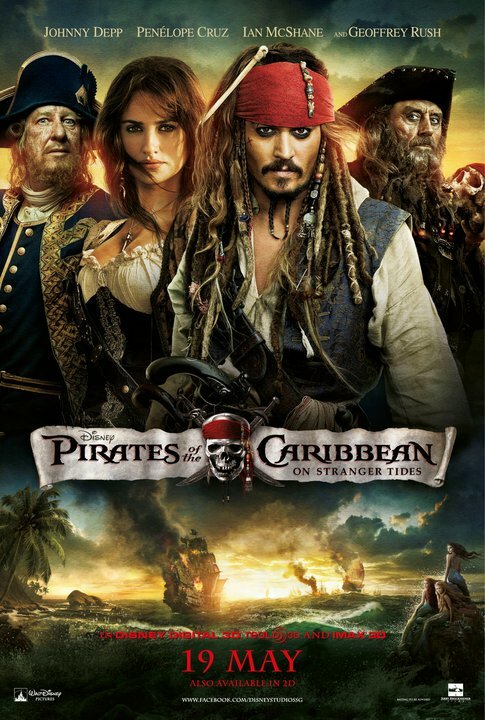 WATCH THE PIRATES OF THE CARIBBEAN: ON STRANGERS TIDES MOVIE TRAILER NOW! I was amongst the lucky few that caught the Pirates of the Caribbean: On Stranger Tides at the Gala Premiere last night. And you know what? I am planning to watch it again this weekend! Crazy? Oh yes. But the Pirates of the Caribbean is definitely a show worth catching over and over again. For the latest updates about the Pirates of the Caribbean: On Stranger Tides, visit the official Disney POTC 4 homepage or POTC 4 Facebook Fanpage.